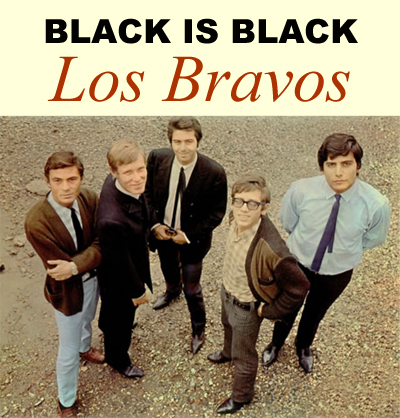 This song was originally recorded by the Spanish rock band Los Bravos and released in 1966 as the group's debut single for Decca Records. Produced by Ivor Raymonde, the song reached No.2 in the UK, No. 4 in the U.S. and No. 1 in Canada. With the song's success, Los Bravos became the first Spanish rock band to have an international hit single. Lead singer Mike Kogel's vocals sounded so similar to Gene Pitney that many listeners assumed that "Black Is Black" was a Pitney single. A French version entitled "Noir c'est noir," was recorded by Johnny Hallyday and held the No.1 spot in France's singles chart for 7 weeks in the autumn of 1966. The song was also covered by French vocal trio La Belle Epoque and released as a 1976 single which peaked at No.2 the UK and reached number one in Australia the following year. Our style is a refreshed up to date version for modern instruments.